This cladogram shows the clade of superfamily Hominoidea and its descendent clades, focussed on the division of Hominini (omitting detail on clades not ancestral to Hominini). 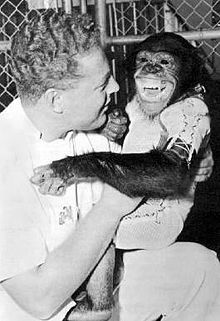 The family Hominidae ("hominids") comprises the tribes Ponginae (including orangutans), Gorillini (including gorillas) and Hominini, the latter two forming the subfamily of Homininae. 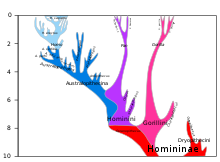 Hominini is divided into Panina (chimpanzees) and Australopithecina (australopithecines). The Hominina (humans) are usually held to have emerged within the Australopithecina (which would roughly correspond to the alternative definition of Hominini according to the alternative definition which excludes Pan). Genetic analysis combined with fossil evidence indicates that hominoids diverged from the Old World monkeys about 25 million years ago (Mya), near the Oligocene-Miocene boundary. The most recent common ancestors (MRCA) of the subfamilies Homininae and Ponginae, lived about 15 million years ago. In the following cladogram, the approximate time the clades radiated newer clades indicated in millions of years ago (Mya).